As many of you may remember, this past summer I helped volunteer at Special Olympics Albania alongside many awesome Albanian volunteers. 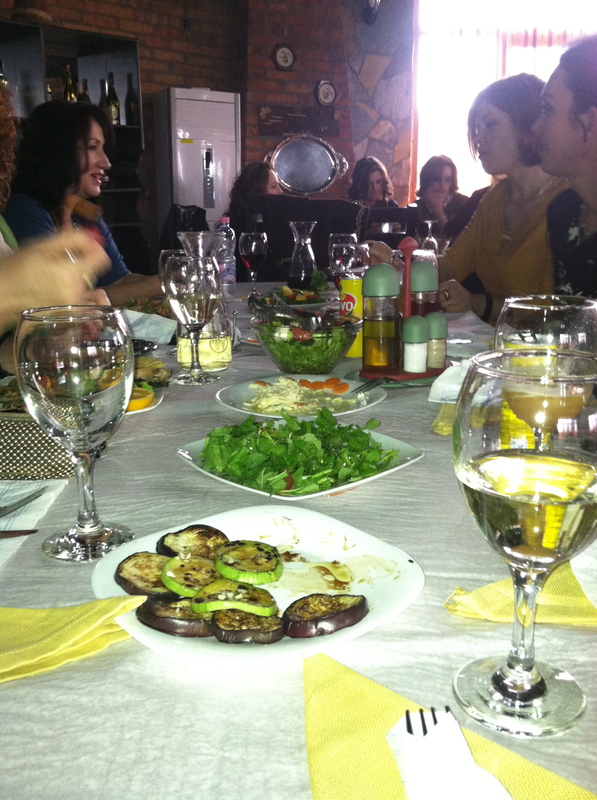 The Albanian volunteers and Peace Corps volunteers worked together to make the participants’ experience one to remember. 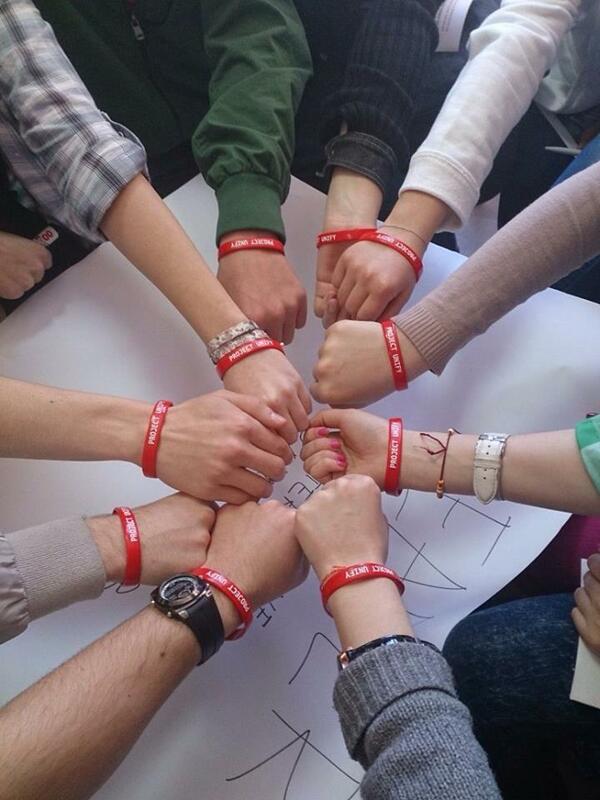 Special Olympics Albania is starting a new initiative this spring called Project UNIFY. Project UNIFY is an initiative through Special Olympics that aims to bring together youth and people with intellectual disabilities through sports and education programs. All the participants come together and unify through sports and other projects. Everyone is equal on the game field. Project UNIFY works with students to develop skills as change agents in their communities to begin advocating for those with intellectual disabilities. The program works with schools to develop youth leadership, community collaborations, communications, professional development, unifying programming, and sustainable relationships. Through inclusive sports and programming friendships are formed amongst all participants creating an environment of respect, dignity, and advocacy for all. The program has been around for seven years and is just coming to Albania. 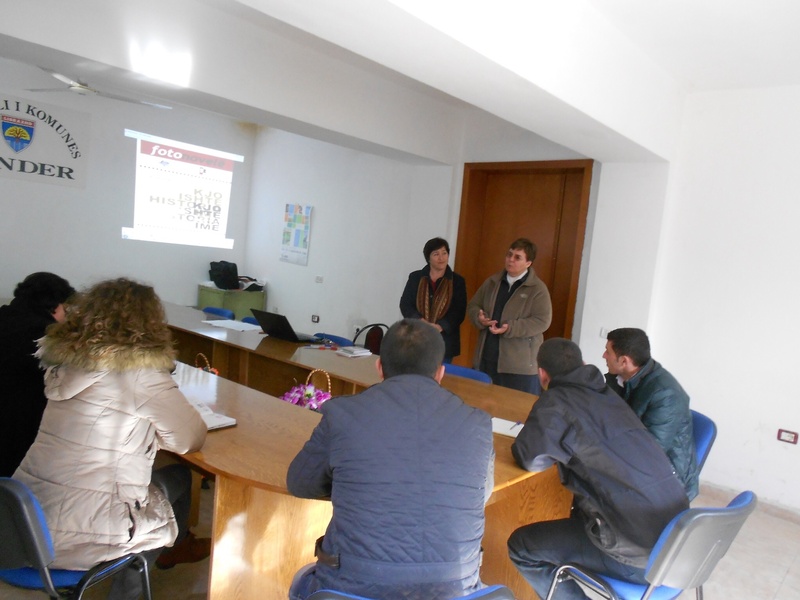 The pilot program in Albania is focusing on two schools in Tirana, the country capital. During Spring break last week, students from the high school were invited to a short 3-hour training to learn more about the program and benefits of participating in unified sporting events. The students learned about Project UNIFY, appropriate terminology when working with people with intellectual disabilities, and brainstormed ideas on how to include all people within community activities. Another Peace Corps volunteer and I were invited to share our volunteer experiences from this past summer with the students. We also helped facilitate some of the small group work during the training. Later on in the year, these two pilot schools, alongside Peace Corps volunteers, will come together with people with intellectual disabilities for unified sporting games. I am hoping their will be a possibility to include the youth group at my site in some of these games. The sports that were offered during the last Special Olympics games included basketball, table tennis, bowling, and soccer. These same sports will also be part of the Project UNIFY programming. After the initial games, Project UNIFY aims to have students and their communities begin grass-roots games to continue the initiative in their neighborhoods. To learn more about Special Olympics Albania visit their Facebook page. The participants from the first training. Some of the key leaders of Special Olympics Albania. The participants at the second high-school training. Growing up as a Millennial, part of Generation Y, technology has almost always been a big part of my life. Once I hit middle school, I began spending copious amounts of time on AIM, Myspace, and other social media outlets. The constant connection to people through technology and social media continued into high school when I received my first Facebook in 2004. Facebook was originally only a social outlet for college students and then it opened up to high school networking. When I first joined Facebook, users had to be invited to join and you could not join without an invite from a current member. Oh how the times have changed! Technology and social media have been a central part of my life; I have almost had Facebook for half my life. That being said, I have always been connected to these sites, spending hours chatting with friends, posting photos, and catching up on the Newsfeed. I probably like Facebook and social media a bit more than your average person (or I can at least admit my time-consuming love). Sometimes social media is somewhat of an addiction, but it is what it is. 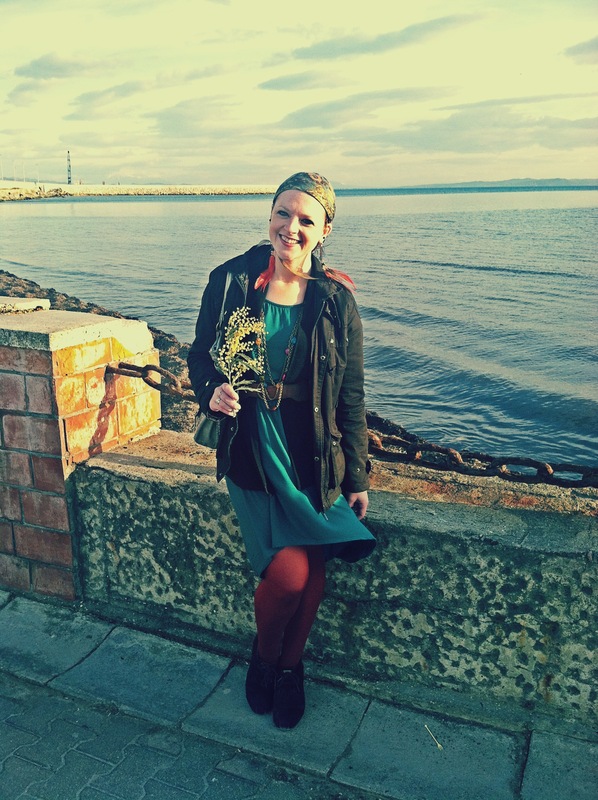 I was initially worried when I applied to join the Peace Corps that I would not be able to stay in contact with my friends and family back home, but luckily I was sent to Albania – where internet connection is prevalent and there is an opportunity to get wireless internet set up in volunteer’s homes through the local internet providers. After I finished Pre-service training in the village, I moved into my own apartment and had the opportunity to set up internet in my home. At first I decided to not have internet because I didn’t want to use it as a crutch for my boredom (which I definitely do at times – it’s inevitable). After a couple weeks without internet, I caved and set it up. It was definitely a good choice because a lot of Peace Corps communication is sent via email and since I am on several committees we also use email and the internet to do most of our communication. Being in Albania, two major social media outlets have completely changed my experience here for the better: WordPress and Facebook. At first my blog was just a small attempt of updating my friends and family back home about my life and adventures here in Albania. When I first began writing the blog it was very mundane and just followed my daily happenings in the community. It was hard to update my blog during pre-service training because I did not have consistent access to internet in the village while living with my host-family. After writing blogs mainly about my daily routine, I decided to describe “50 Unique Observations about Albania” based on my initial impressions of the country and my small travel experience abroad. A lot of my observations that seemed unique to Albania, can actually be seen in several parts of the Balkans. However, at the time I had only traveled outside of the United States to Mexican resorts with my family, so I didn’t really have much experience abroad under my belt. Sometime in the late summer that blog post went viral and received over 50,000 views in under a week. Super overwhelming, to say the least. At that time I was still in culture shock, having a hard time adjusting to living and working on my own in a completely different culture. There was nothing that I could do to stop the attention. People had gotten a hold of my blog and began sharing it on Facebook, and then their friends shared the link, and so on until I received thousands and thousands of views per day. Some people were mad; others found my posts inspirational and eye-opening. Can’t please them all. Since my blog went viral, I have used my presence on WordPress to educate people back in America about my experiences abroad, as well as Albanians within the country. Several publication companies, including the Tirana Times, a newspaper in the capital of Albania, have contacted me to publish pieces. Pink Pangea, an online community for women abroad, published the most recent piece regarding sexism in Albania. Now over six months later, I still continue to receive hundreds of views a day. Just the other week, I was stopped while traveling outside my community by a nice Albanian woman who is an English teacher in Tirana. She recently read my blog and was using it in her classroom as a discussion topic! Hopefully, sometime during my service I will be able to guest lecture in one of her classes. My blog acts as an avenue for discussion about Albania today and how we can all work together to improve this beautiful country for the better. I am so happy that I decided to begin writing a blog because this experience will forever be a part of me, even if my bad-memory persists. I will always have this journal of my time here and for that I am grateful. I am also grateful to all the Albanians and people around the world that do read my blog and continue to praise me for my work and time spent here. All of your comments really do fuel my fire and help me feel better about the work that I’m doing here. I am glad that I can serve as an inspiration and fresh perspective. 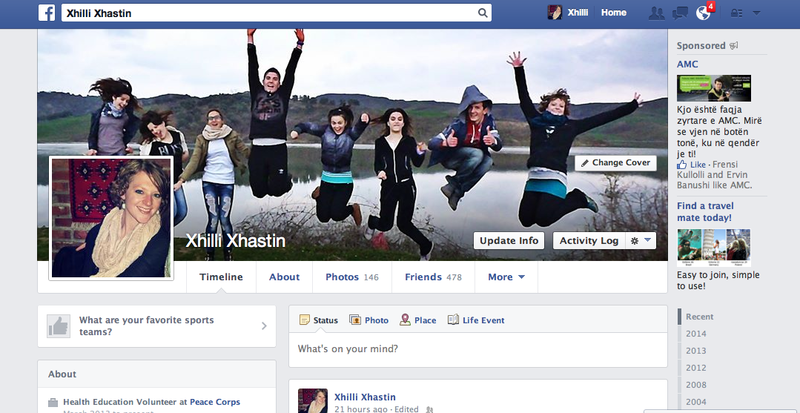 After my blog went viral I decided to set up another Facebook account under my Albanian name Xhilli Xhastin (it is how you spell Jill Justine in Shqip). This Facebook account opened up so many new doors for me because it became a way for me to network with Albanians all across the country. Students from national Outdoor Ambassadors events, followers of my blog, other volunteers I met through Special Olympics, people in my community, and anyone who adds me is welcome to be my friend and get an inside look at some of my experiences in Albania. Through this Facebook account I created a health promotion page called Këshilla për Shëndetin Shqipëri (Advices for Health in Albania). The page posts information according to annual health calendar distributed by the Ministry of Public Health. I post information in Albanian about health advice, community health events, and basic health information. My Albanian counterparts help me with the page through translation and identifying pertinent information. As of now, the page has 497 likes and I hope to have at least 1000 likes on this page before I finish my service. Hopefully, after I leave Albania, this page will become sustainable through the work of other health education volunteers in group 17 and their Albanian counterparts. I am also in charge of several other Facebook pages including ATIP Albania, Outdoor Ambassadors Albania, and Outdoor Ambassadors Kavaje. These Facebook pages follow the work of Peace Corps volunteers and students in their community. The ATIP Albania page focuses on the anti-trafficking efforts in Albania through the Peace Corps anti-trafficking committee. The Outdoor Ambassadors Albania page highlights the work of environmental youth leadership groups across the country and the Outdoor Ambassadors Kavaje page shows what activities the youth group in my area is working on. Having Facebook pages has been a wonderful way to promote my service in Albania, as well as a great way to promote the work of awesome Albanians and other organizations in this country. Along with Facebook pages, Facebook groups have been a wonderful way to communicate with students in my community. These groups allow for Peace Corps volunteers and students to discuss youth group initiatives, homework help, etc. We use a Facebook group to plan Outdoor Ambassadors projects and community work in my site. It is an easy way to communicate because a lot of the students have a Facebook app on their phones. Facebook has been such a great way to keep in contact with Albanians and people back home. It has also introduced me to another aspect of Albanian culture, because Albanians LOVE Facebook. Observing how Albanians use social media and Facebook has really given me another insight into their culture and has allowed me to become better friends with people that I wouldn’t have been able to connect with otherwise. A big thing that I have noticed about how a lot of Albanians use Facebook is that they love to “like” everything. I will post a photo and within the hour it will usually have 20+ likes and some photos even have over 100 likes. Especially selfies, most Albanians love selfies. I enjoy using Facebook and having another account has vastly improved my service. My online persona is just as important, if not more so, than my persona within my own community. So, if you haven’t already, please add me on Facebook and follow these Peace Corps pages. Peace Corps Albania is even hopping onto the social media buzz and we are the first Peace Corps country to have our own Facebook page. Social media is a powerful tool and using it to my advantage has been an integral part of my time here. 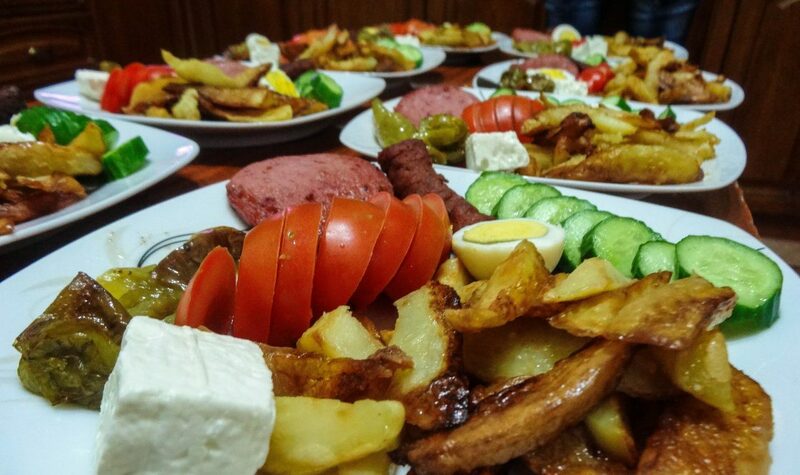 Vitin e Parë në Shqipëri! 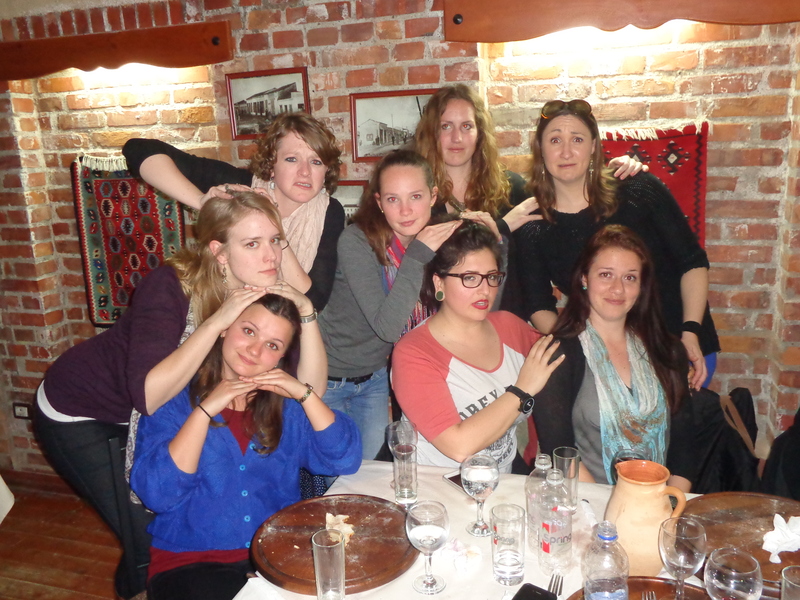 Check out this video that I made to commemorate Group 16’s first year of service in Albania. This slideshow shows pictures of everyone in our group and some of our experiences living and working as Peace Corps volunteers abroad. It’s been quite the ride and I can’t wait for our second year! Embrace the chaos. 1. Life is all about perspective. Perspective can make or break your Peace Corps service, and your life. If you look at everything with a negative lens, everything will seem negative. It is important to maintain a positive perspective on life. 2. Networking is important. Networking and establishing relationships with people is an vital part of maintaining work and community connections. I learned that in order to get any work done in my community it was imperative to have a positive relationship with my Albanian counterparts. 3. Patience truly is a virtue. This is especially true when working in a community outside the hustle and bustle of the states. Things that would normally happen in a day in America, often take a week or more here. Things that happen in a week, usually take a month and things that happen in a month could often take up to a full year. I often remind myself of the mantra, “just breathe” because I am in situations daily that test my patience. Whether it be waiting for over an hour to catch public transportation or dealing with a difficult work situation – patience is key. 4. Don’t measure success only through work. This one was especially difficult for me to comprehend because my whole life I have been conditioned to think that success comes from work, but in reality, to be successful in life is so much more than doing a good job at work. It is better to look at success through how many positive relationships you foster in your life, or how many people you make smile in a day. 5. Know when to say ‘no’ and when to say ‘yes’. People are always going to want things from you and it is important to know when to say no. Personally, people are always stopping me, asking to help them get to America or learn English. I honestly don’t have time for certain things and have learned the skill of letting people down easily. I am not going to have a billion coffees with people everyday because my alone time is important for my sanity. Guard your time and know when to accept and when to decline. 6. Be grateful for something everyday. I spent a good majority of my life in a depressive state of mind, often feeling sorry for myself for things that happened in my past. The only person that this negative attitude really affected was myself. Everyday is full of special moments and something to be grateful for. Even just being grateful for a warm bed or the sun shining can turn a negative day in a positive day. Changing your mindset and having gratitude really helps in fostering a happier, healthier lifestyle. 7. Admit faults and failures. Failures are merely stepping stones and life lessons. If you never fail, then you are never pushing yourself outside of your comfort zone. My service has been full of ‘successful failures’ and admitting those failures have helped me grow and find projects that are truly worth my time. No one is without failures. 9. Mental and physical health is key to maintaining sanity. Taking time out of my day everyday to exercise and meditate has been my savoir here. I am now in the best shape of my life because I have taken time to work out everyday. Fitness doesn’t just happen overnight, it is a process. I am still working towards a more healthy, fit lifestyle. Now I can proudly say that, for the first time in my life, I can do a real pushup and I can run for over a mile outside without stopping. These are great accomplishments for me. 10. Kindness is more important than correctness. This one can be hard for me sometimes because I often get into discussions with others where we do not agree on certain topics or issues. I now take these conversations as an opportunity to be kind, rather than to be correct. We all have different experiences, perspectives, and ideas in life. Sometimes it is better to nicely disagree, rather than arguing about who is correct. 11. Time is of the essence. Time flies by. Life flies by. 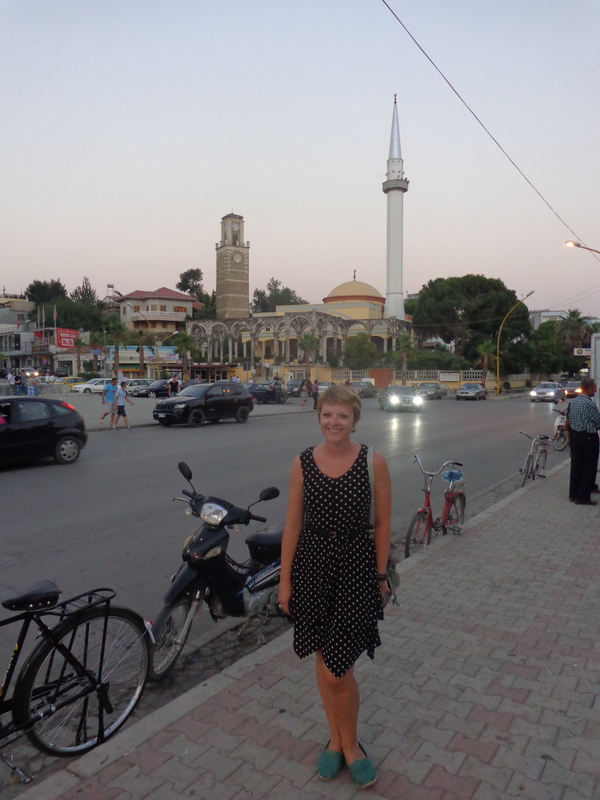 Sometimes the days felt like they were years, but looking back at my first year in Albania I sometimes find it hard to believe that I have already been here for a year. Now my service is almost half-way over. Use your time wisely. Whether that means picking up a new hobby or spending time reading or exploring. Do one thing everyday for yourself and remember that time doesn’t stop for you. 12. No one is going to hold your hand through life. I definitely learned this one quickly after Peace Corps dropped me off after staging with my host family and I could barely say, ‘how are you’ in the local language. Awkward. Then relearned this again after traveling to site and having the overwhelming feeling that no one will be there to hold my hand along the way. Self-motivation is key to being successful in life and in Peace Corps. Staff will not be following you around or calling you everyday to see what you’re doing. You have to motivate yourself to do things in your community that you want to do. You have to motivate yourself to have successes. 13. Everyone isn’t going to like you. Ain’t that the truth? I have always wanted everyone to like me. Really who doesn’t want to be liked? But the truth is, not everyone is going to like you. And sometimes people don’t even have a good reason not to like you. Everyone in life is not going to always get along and like each other. Spend time with people who do like you and forget about those who can’t see how amazing you are. 14. Love yourself. Cliché I know, but if you don’t love yourself how can you expect anyone else to. I have spent so much time not liking myself and not liking certain aspects of the way I look or the way I react to things. I can honestly say, that I truly do love myself now. It took a move across 5,869 miles to finally realize that I am worthy of love and that I am worthy of self- love. 15. Don’t judge what you don’t understand. Sometimes it is so easy for me to judge things here that I don’t understand, but I often have to put myself in check and realize that there are lots of things here that I will never understand. Rather than judging people or things, I try to learn from these experiences and expand my mind regarding differences in all of us. 16. Comparing yourself to others is deadly. 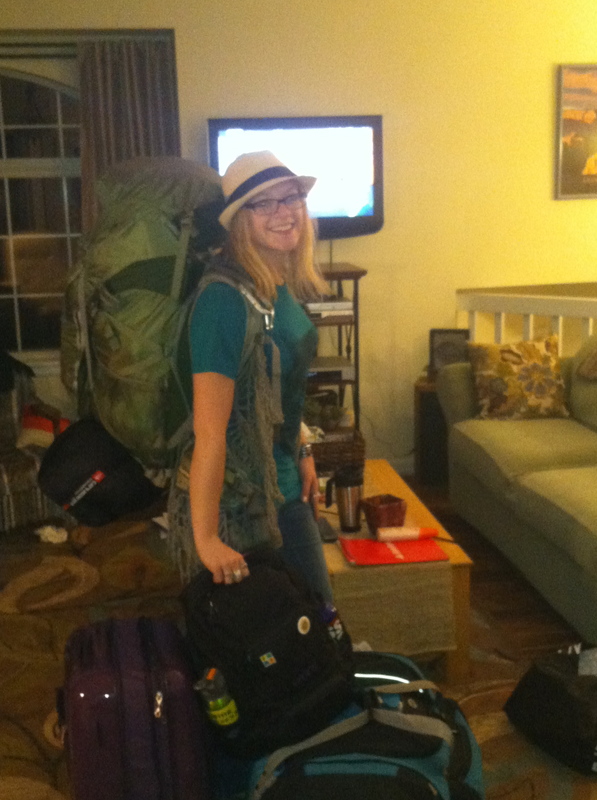 This one is a killer of most Peace Corps volunteers that I know. We are often all comparing ourselves to each other (whether we admit it or not). This isn’t only a Peace Corps thing, but also a life-thing. It is easy to envy others and things that they have that you don’t. In Peace Corps specifically we all may be in the same country, but we all have vastly different experiences. Two people may even live in the same town, but have completely distinctive understanding of life here. Men and women live dissimilar lives here and it’s often hard to imagine the other side of things. Instead of comparing ourselves, it’s better to just support each other in our successes, failures, and everything in between. Remember that your Facebook feed is full of people’s happy moments and things they want to share with friends. Usually people don’t post things regarding disappointments, depression, or the like. Facebook is not a well-rounded reality, so don’t compare your daily routine to the fake reality of social media. 17. Slow down. Like I mentioned before, time is of the essence. Slow down. Take time to smell the roses or go on a bike ride to the beach. Take time to sit and have coffee with your coworkers, even when you just want to work, work, work. Life is too precious to rush through without noticing the little things that make it wonderful. Xhiro, and xhiro slowly. 18. Set realistic goals, and set them often. 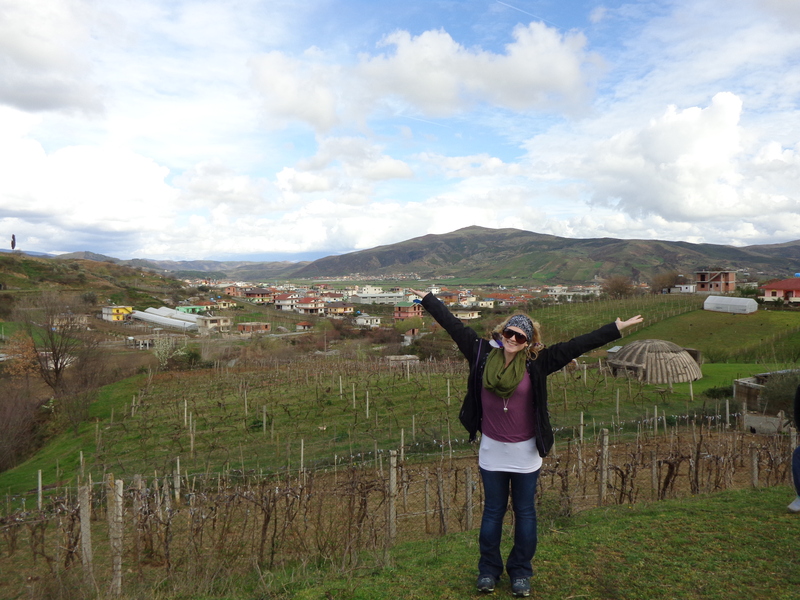 I came into Peace Corps knowing that I wouldn’t change the world, but I still wanted to try. I had a lot of unrealistic expectations about what my service would entail. After being here for a year, I have realized the importance of creating reasonable goals and reevaluating them often. Having sensible goals makes for a successful service and a successful life. 20. Be yourself. I was so worried that I needed to act a certain way because I am living in a completely different culture. It is good to be culturally sensitive, but also maintain your true character through it all. I feel like I have impacted far more people just by being myself and sharing a positive life outlook than I have with actual health sector work. Be yourself, because YOU are awesome! At my parents house the night before I left for Albania. In my host-families village during pre-service training a year ago. Hanging out in my city over the summer. Celebrating Women’s Day recently. One year down! One to go! 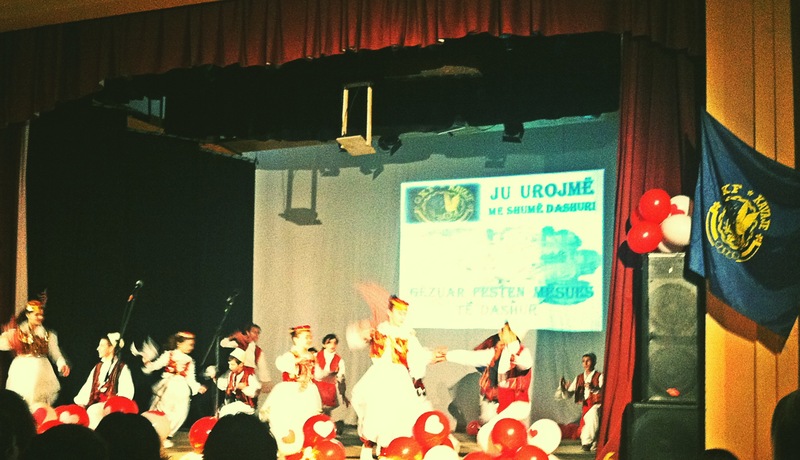 The month of March has been full of fun Albanian holidays, as well as my birthday. It has been a busy first half of the month working and celebrating. The four major holidays that I have celebrated thus far in March have been: Teacher’s day, Women’s day, my birthday, and Summer’s day. Teacher’s day is a major Albanian holiday. Every year on March 7th schools all over the country celebrate Teacher’s day in commemoration of the first Albanian school. Usually the day consists of student performances and gifts for the staff, as well as a party for only the teachers. 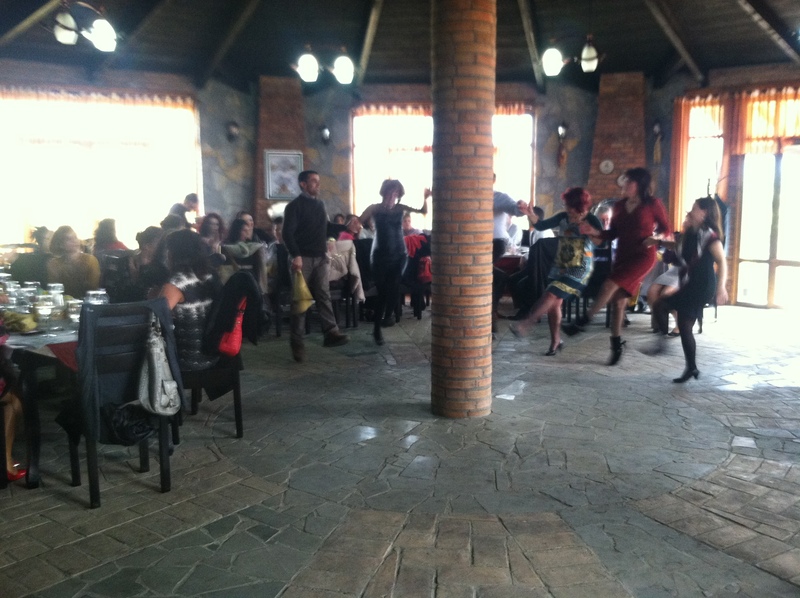 In my site, the culture center put on a wonderful show for the teachers. It consisted of singing, dance, musical instrument performances, and traditional dance. One of the student hosts was actually one of the students in the high school youth group. It was awesome to see him perform and be a leader in the community outside of the youth group. Besides the culture center show, I celebrated Teacher’s day with a the teachers at the high school. Luckily, I have an “in” with the high school because I occasionally work with the school psychologist and I have befriended several of the other teachers. It was nice to be invited to the lunch party that was only for the teachers. The party was quite the experience and I had a blast observing another aspect of the culture. Teachers were dressed up to the nines for this occasion. Some of the different styles I noticed were: a pleather black dress with a matching pink pleather jacket, a pink prom dress, tons of animal print and tons of fake jewels attached at the bust, coats of bright lipstick, high heels – the higher the better, and extremely long nails with giant jewels glued onto the index finger. My American friends and family might relate some of this style to prom in the 80s or 90s, but like I’ve mentioned before – Albanian style is very-much different than American style. What is considered classy and fun here, would probably be considered “trashy” where I am from, but I absolutely love it and wouldn’t have it any other way. When the director walked in an hour late rocking red heels with gold spikes, a hot pink/black flower above-the-knee dress, hair done-up in a beautiful up-do, and chunky gold jewelry, I couldn’t help but think how confident and awesome she is. The teachers rented a double-decker bus to transport all of us there and back – it was the first time I ever rode in one of those. The party itself was held in a village near my site at a nice restaurant. 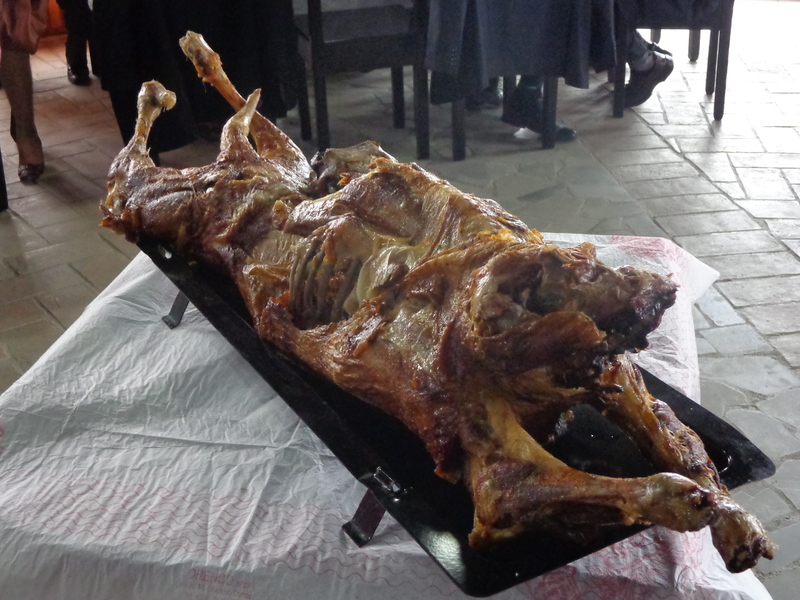 We were served traditional Albanian food and they killed an entire sheep for the occasion. 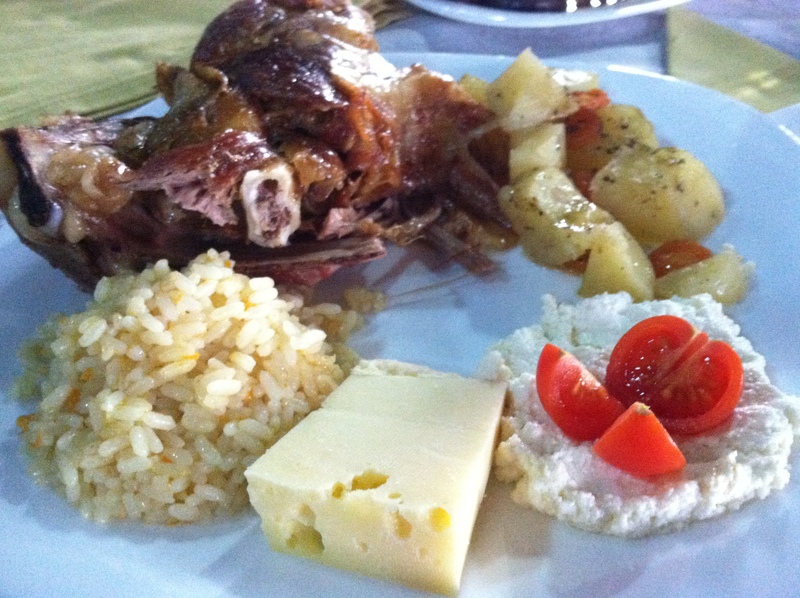 When in Albania… eat as the Albanians! Even though I was a vegetarian in the states, I eat meat here to taste the culture, and, the culture tastes good. No Albanian party is complete without valle (circle dancing) and I definitely got my dance on with a few of the teachers. The cultural center show for the teachers. Some of the food at the luncheon. 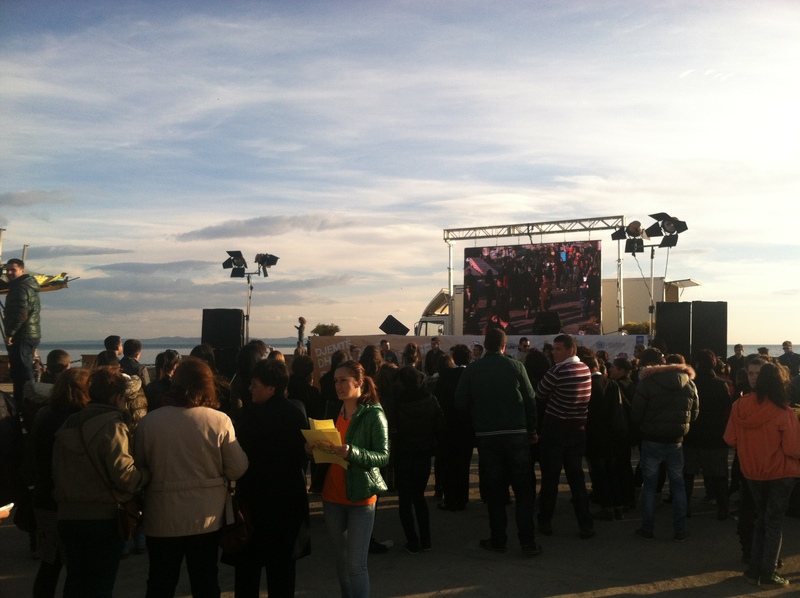 Women’s day celebration in Durres. One of my good friends Sara. Round 1: I am so lucky to have connected with some awesome volunteers in this country. My lovely friends Paul, Susan, and Sara took me out for a fancy dinner in northern Albania at a famous restaurant, Mirizi Zanave. 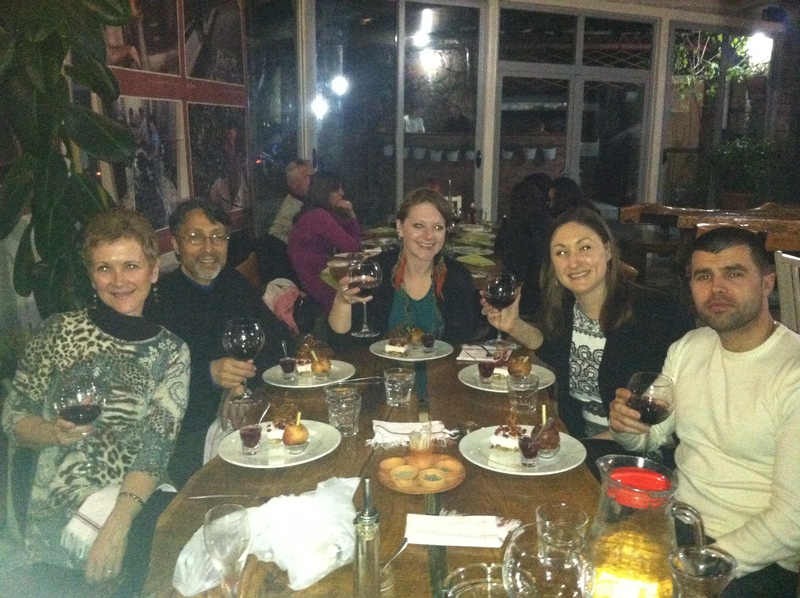 The dinner was full of delicious Albanian delicacies, tasty wine, and topped off with an amazing birthday cake. Truly blessed to have such caring and supportive friends. Round 2: In Albania, it is the tradition for the birthday girl/boy to pay for all the coffees and bring friends/coworkers sweets and goodies. You invite your friends out for coffee and lunch and then you pay for it. This surprised me at first because I am used to the American birthday tradition. I love being showered with gifts and goodies on my birthday, but when in Albania do as the Albanians do. To celebrate my birthday off right I bought enough chocolate to hand out to my neighbors, coworkers, and favorite store owners. I also made brownies for my closer friends. Throughout the day I passed out candy and took my friends out for my birthday coffees. 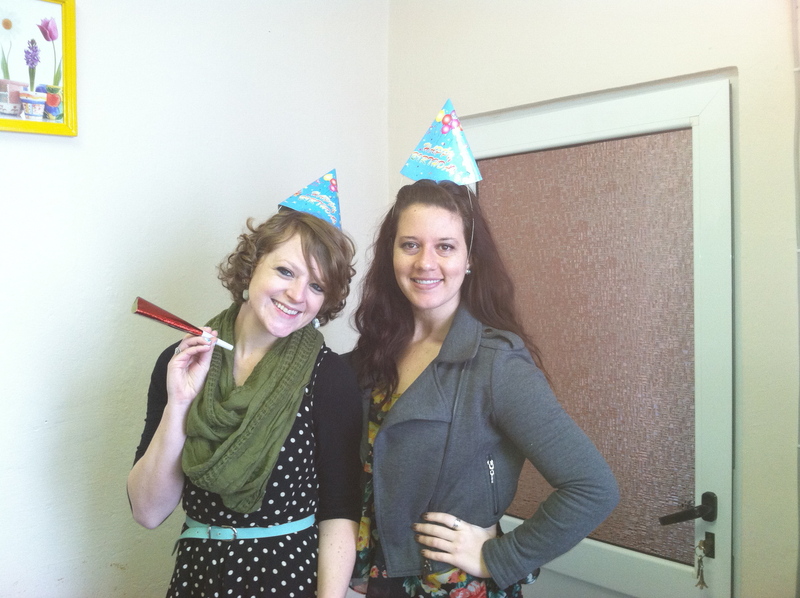 My wonderful site-mate Kate surprised me with a delicious cake and mini-party in my office first-thing in the morning. 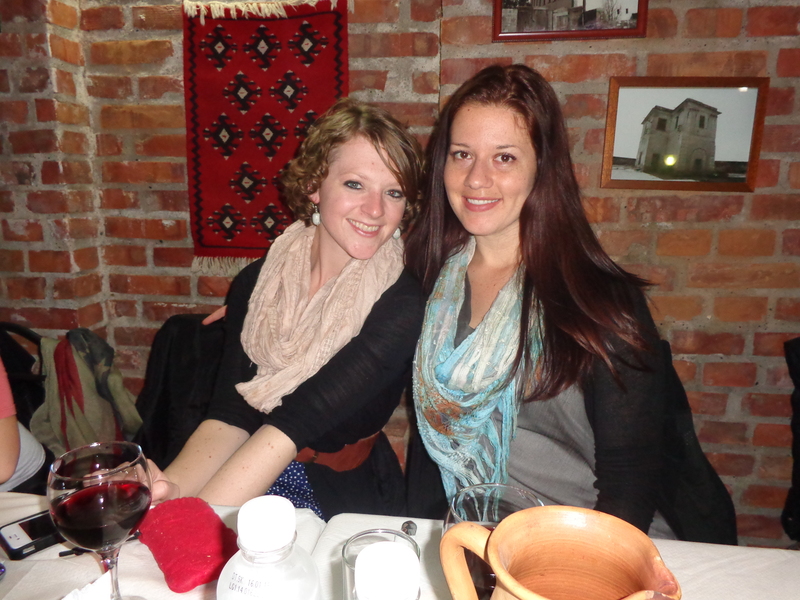 She made my first birthday in Albania an experience to remember. Round 3: After celebrating my birthday the Albanian way, I decided to also have an America celebration as well. I invited some of my favorite volunteers from across the country to my site for a small dinner party. We went out for pizza and more wine in one of the best restaurants in town. Once dinner was finished we danced the night away in my apartment – American style. 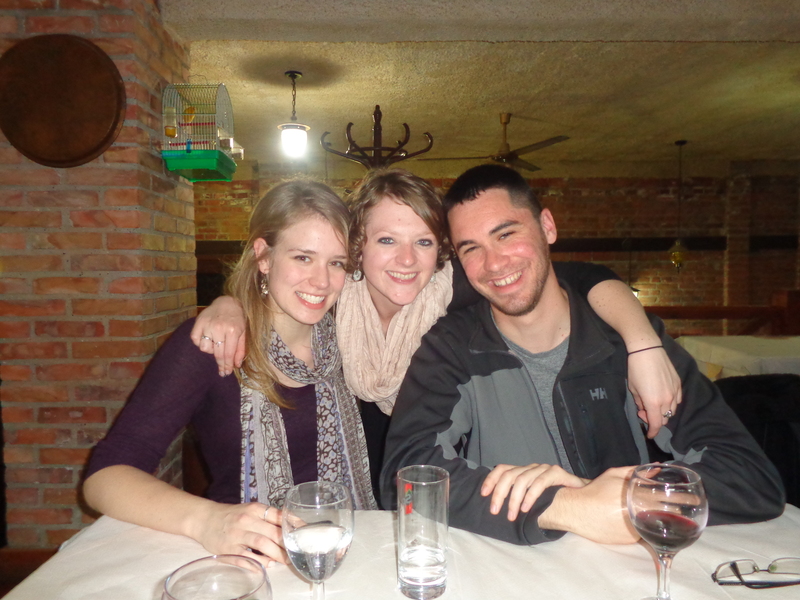 My first birthday in Albania was an amazing time! 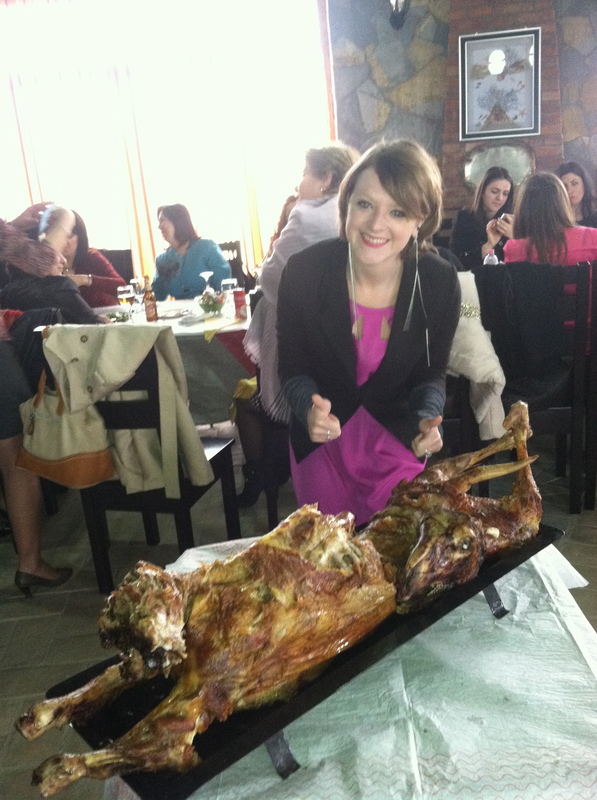 Birthday dinner in Lezhe: Round 1! 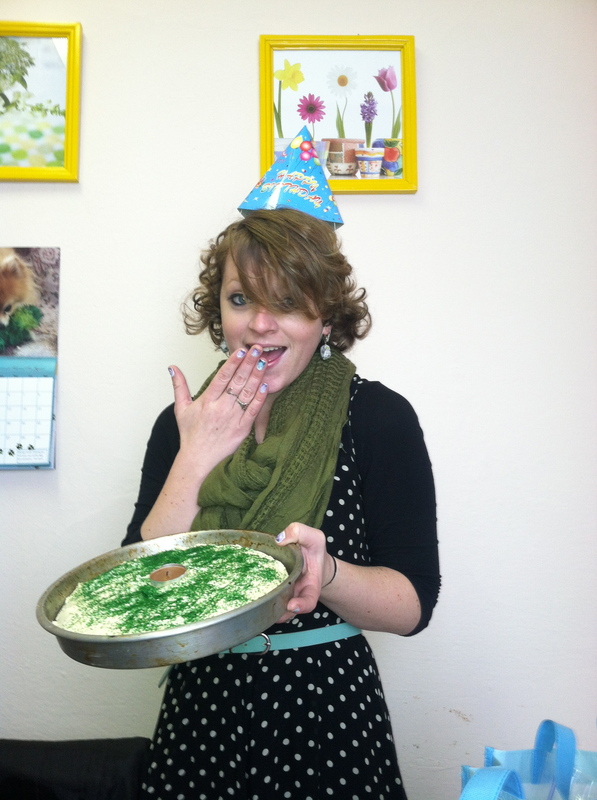 Surprise birthday cake in my office! I literally ate the entire thing on my birthday – so delicious! I have such an awesome site-mate. My good friends from pre-service training. All us girls being funny at the restaurant. Summer’s day is celebrated every year on March 14th in Albania to celebrate the end of winter and the changing of seasons. The main festivities are held on the streets in Elbasan. 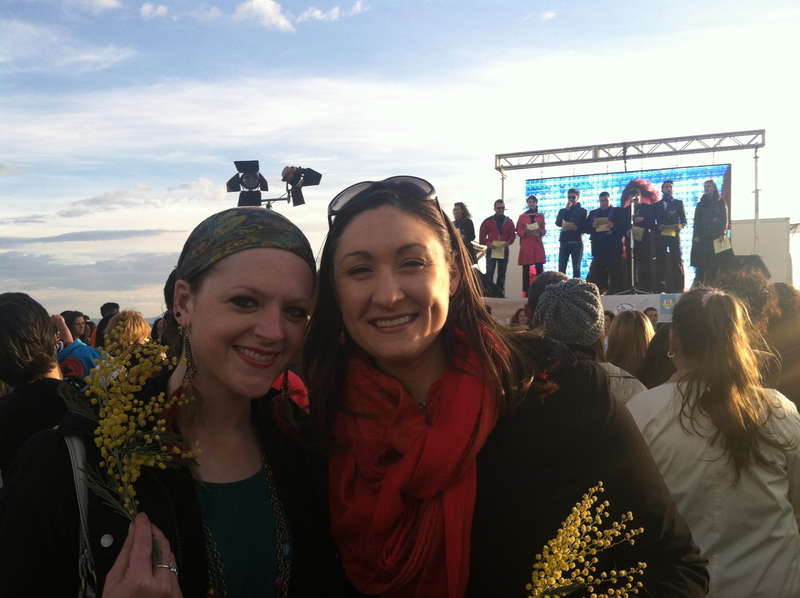 The holiday is celebrated, like any Albanian holiday, with valle (circle dancing), music, and other fun festivities. In Elbasan, a traditional cookie called ballakume is widely sold on the streets. I have yet to actually try this cookie, which is honestly just not acceptable since I have now been living in this country for a year… maybe I will try one soon! In my community, the holiday is celebrated mainly by young children. It is tradition for the children to visit your home early in the morning and bring gifts in exchange for candy and other goodies. My first visitors arrived at 6:40am. In America, if anyone arrived at my home before 8am in the morning it would be a sin, but I am willing to forgo my beauty sleep for some cuties at my door. I probably scared the children when I answered the door because I literally rolled out of bed with zit-cream still on my face, hair knotted up like a bird’s nest, and threw on an over-sized sweater and some yoga pants. 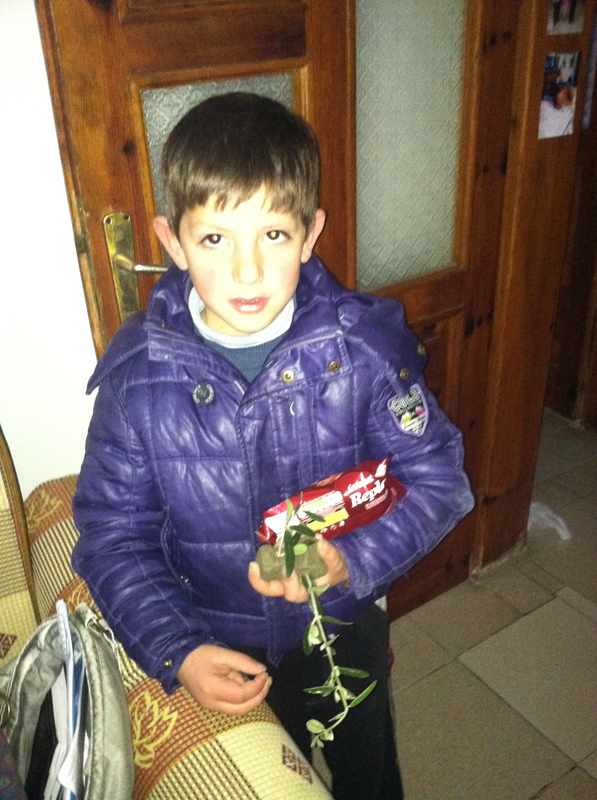 I energized myself enough to have a short conversation in Shqip and hand over the precious candy in exchange for some kind of plant inside a make-shift clay block. Overall, it was fun to experience the tradition, but if children come to my door before 7am for candy any other day of the year I may be a little merzit. My neighbor in my house bright and early waiting for candy. Thus far, March has been an awesome month for me. I am really starting to get into the swing of my service and a lot of projects are beginning to open up for me! I will be submitting my first grant proposal later this week; wish me luck! The proposal is to have several cervical cancer education trainings in the villages surrounding my site and then provide 100 women will free PAP smears. I really hope that we get the grant! During the summer, volunteers had the opportunity to apply for several different Peace Corps committees. After an application process, I became one of the four volunteers picked to follow group 15 (the group of volunteers before my group) volunteers for the Anti-Trafficking in Persons committee. I was initially very interested in working with this committee because of my background in social work and my interest in human rights and trafficking of people. The other three volunteers picked to take-over the committee were also female health volunteers coincidentally. Since we have begun working on the committee several exciting things have come to fruition. ATIP is definitely one of the most well functioning committees of Peace Corps that I am on and it is because of all the hard work of group 15 and other committees’ prior. That being said, ATIP is about to rock this country! We have several awesome projects that are in the work and I am so excited for this upcoming year. 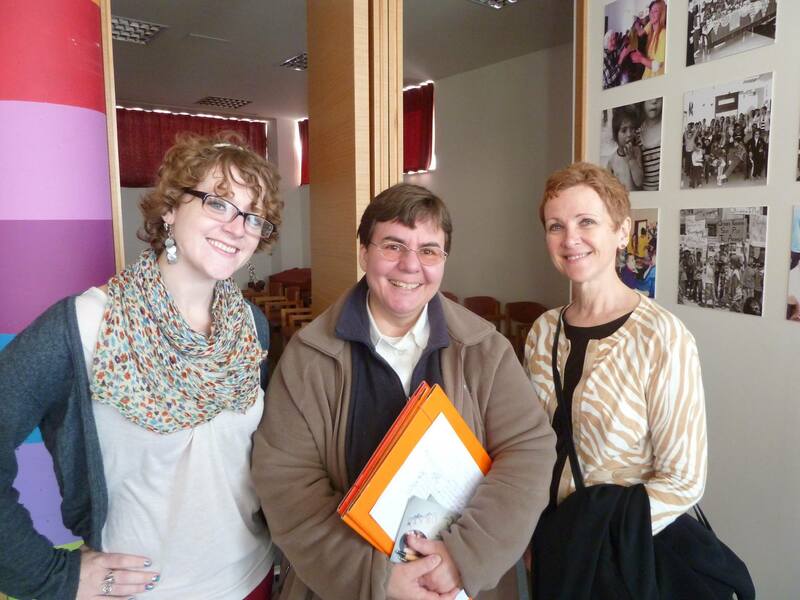 The first big project that we are collaborating on is with two NGOs based in Tirana. Mary Ward Loreto is an NGO that works with marginalized women in the field of anti-trafficking to raise awareness to excluded and isolated areas of Albania. Different and Equal is another NGO that works in the realm of anti-trafficking. They offer services to reintegrate victims of trafficking back into the community. D&E even has a shelter in Tirana to give victims of abuse support and protection. These two organizations work together and have been meeting with members of the committee since before the group switch. This year MWL decided to give 40 different anti-trafficking trainings around Albania focusing on educating women and underdeveloped populations about the effects of human trafficking, as well as signs of someone at risk. The actual training uses handouts, small group work, an awesome Powerpoint produced by the ATIP committee, large group discussions, and different visual media including several videos. The ATIP committee is helping MWL and D&E through hooking them up with different volunteers in areas all around the country. ATIP gauged volunteer interest and then collaborated with the volunteers to help set final details. The individual volunteers did all the work in their sites to find the venue, date and time, and participants, and then the committee set them up with a free training! After the volunteers figure out the initial details, the NGOs come and give the training and provide refreshments. It is a great opportunity for volunteers to bring an established NGO to their community to provide education about a very serious and important topic. Thus far, two trainings organized by volunteers have taken place. One in a underserved village outside of Durres and the other in Librazhd. 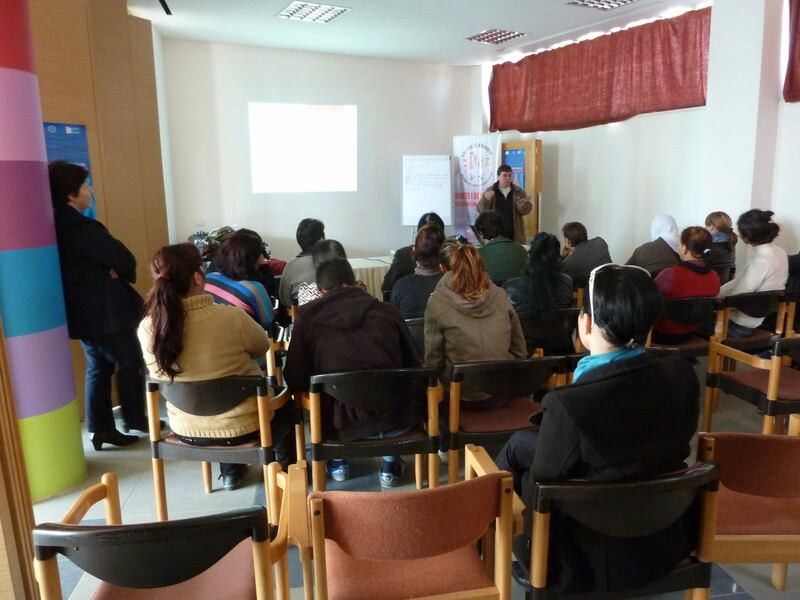 The training in Durres focused on women and the training in Librazhd focused on community professionals working the health centers, town hall, and other community centers. Both trainings were very successful and volunteers who attended have expressed satisfaction. I was lucky enough to attend the training outside Durres and I hope to attend several others throughout the year. I am also hoping to implement this training in our GLOW: Girls Leading Our World day-camps over the summer. Note: If you live in Albania (Albanian, missionary, etc) and are interested in setting up a training like this is your area please contact me! We’d love to help set up something in your community if you have the participants and location. Working during the training in Librazhd. Group 16 ATIP was very interested in partnering with D&E to have a conference focusing on human trafficking. There are several camps and conferences organized by volunteers throughout the year, but none of them touch on the topic of anti-trafficking extensively. Recently, the committee, partnering with D&E, submitted a Democracy Grant proposal to the US Embassy. Our proposal is to have a 3-day Training of Trainers conference, bringing together school psychologists, health care professionals, and community professionals who work with youth. These professionals will come together to learn different strategies on how to combat trafficking, as well as other effective methods of education that they can use within the classroom. After the conference, D&E has a mobile team that will visit these professionals in their community to help implement local trainings and lessons with those in need. As of now, we do not know if we have received the grant, but D&E has received the grant in the past. Since they have previously been given the money that increases the chances that they will receive the money again! We’re keeping our fingers crossed for now. Hats off to fellow committee member Kat, she spearheaded the whole grant and spent hours making sure it was amazing. Thanks Kat! Please check out our website and Facebook to find out more information about what we’re up to! This summer I am planning to hold 3 separate summer camps. I am the Peace Corps Albania camp coordinator for the Outdoor Ambassadors committee, which means I will be in charge of planning the national Outdoor Ambassadors camp. The Outdoor Ambassadors camp will bring around 50-60 students across Albania together for a 5-day leadership camp. We will be implementing different activities and lessons regarding environmentalism, health and nutrition, recycling, leadership, and other fun activities. The camp will be an overnight camp and students will have the opportunity to learn, as well as the opportunity to network with other students across the country. We will be doing arts, crafts, sports, and all the fun activities you’d normally think of for summer camp. As of now, it looks like the Outdoor Ambassadors camp will be held in late August. You can check out my camp pinterest board and my glow pinterest board to get a better idea of the kinds of crafts/activities I am planning to implement. Of course we can run the camps without these supplies, but your help/donations would be greatly appreciated by me and the girls! If you are interested in sending supplies you can find more information on how to contact me under the “Contact Me” section on the left hand column of my blog.